Good Morning! I have a lovely post for you Mummies today, as you know I'm a busy mummy of 2 little ones and also a full-time childminder so I have my hands full. I'm often out and about so it's important I have a good reliable bag which holds everything I need and also I want something which looks pretty and cheerful. 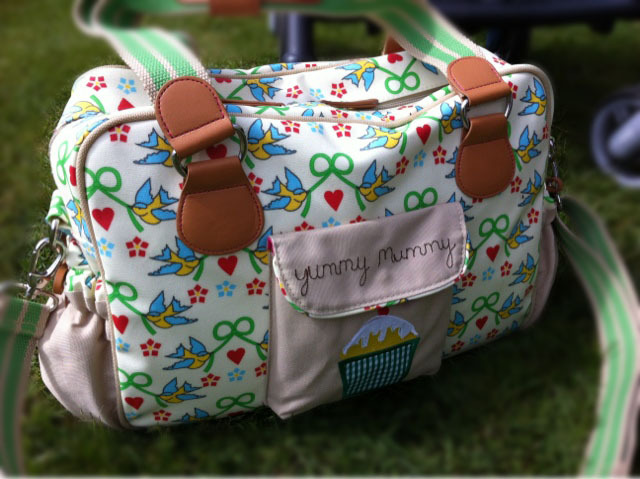 So when I saw the gorgeous Yummy Mummy Blue Birds & Bows changing bag from pink Lining I knew it would be welcomed with open arms! This has become my saviour, it's so easy to keep clean thanks to the special EVA laminated coating. The bag has 2 smaller shoulder straps which can be connected together so they act as one strap, this is a great idea! 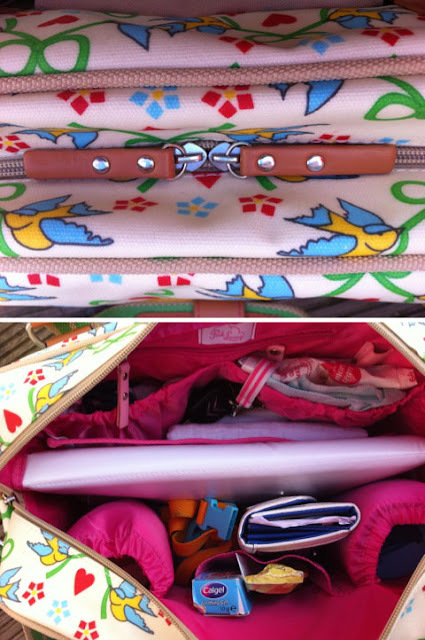 Plus there's a longer shoulder strap which easily attaches to the silver buckles just above the side pockets. This longer strap is ideal to pop over the pram's handles or to be worn across your body. 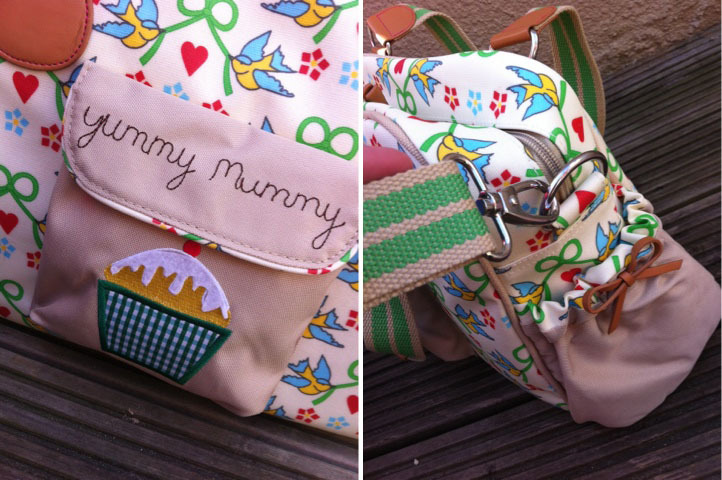 The front canvas pocket has the very popular Yummy Mummy slogan which is stitched across the flap and then a cute yummy cupcake on the front of the pocket. I love the tan zips and the cute little bows on the elasticated canvas pockets either side of the bag, I use these pockets so much! For dummies, juice cups the list goes on. They're nice and deep and elasticated enough that nothing falls out. As you can see from the photo above I can get all my items easily into the bag, I know where everything is and can put my hand to it quickly which is a must when you need something for your little ones. The pattern is really eye catching and I've been stopped in the shops and asked about the bag. You'll make all the mums envious at toddler group I can tell you ha ha! 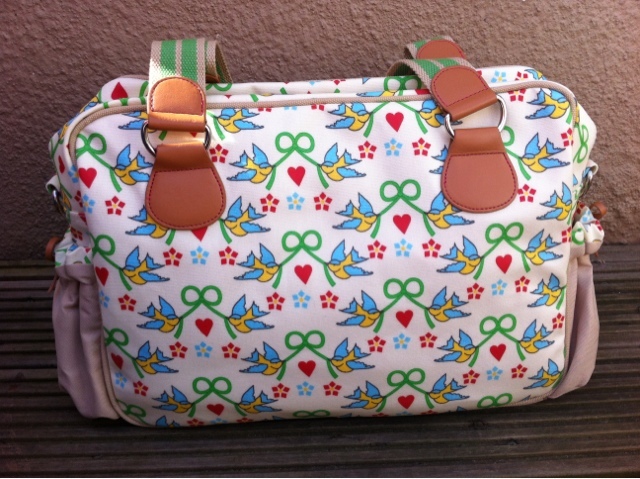 The gorgeous print is all over the changing bag even at the back as you can see below. There is other designs and styles you can pick from, so pop across to the web site and have look. But be warned you'll need your purse at the ready! Have you seen the New SS/12 Pink Lining designs? Which design is your favourite?